Sauce vierge is an uncooked mixture of tomatoes, aromatic fresh herbs and olive oil. I wanted to add some mangoes to give to the fish a little bit of freshness. I served the fish with some braised asparagus. Mix all the ingredients of the sauce together, cover the bowl and let the sauce stand at room temperature for about an hour to allow the flavor to blend. Sprinkle the salmon with salt and pepper. Place the salmon in the pan with olive oil. Place the pan over medium-low heat. Increase the heat to high and cook the salmon for 2 to 3 minutes, or until the skin of the salmon is golden brown. Turn the salmon and continue cooking it in a preheated 375 F oven for 5min. For the asparagus, place them tied with a string in a pan with 2tbsp butter. Season with salt and pepper, and let cook uncovered on medium heat for 10min. 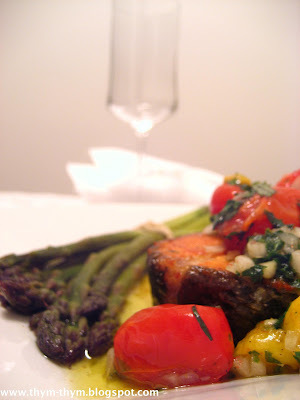 Serve the fish with the sauce vierge on top and the asparagus on the side. Melanger les ingredients de la sauce vierge, couvrir le bol de film plastique et laisser mariner a temperature ambiante pendant une heure. Assaisonner le saumon de sel et poivre. Mettre le saumon dans une poele avec l’huile d’olive et cuire a feu doux au debut puis augmenter document le feu jusqu’a grand feu. Faire cuire pendant 2 ou 3min, ou jusqu’a ce que le saumon devienne dore. Retourner le poisson et continuer sa cuisson dans un four prechauffe a 180 C pendant 5min. Pour les asperges, attacher-les en deux bouquets avec une ficelle et mettre dans une poele avec 2c.s de beurre,sel et poivre. Laisser cuire ,decouverts pendant 10mn en melanger regulierement. Servir le poisson avec la sauce vierge dessus et les asperges sur le cote.